& save over 70% off retail! rush my orderClaim my pads & save over 70% off retail! What is the Naturaful decollete pad? Our Decollete pads are the perfect non-invasive chest wrinkle treatment thatworks effectively to smooth out your chest, cleavage, decollete and décolletage wrinkles - leaving you feeling and looking younger and full of confidence. Apply to your delicate chest area, and it’ll work while you sleep to relieve and visibly soften wrinkles, so you wake up looking refreshed and ready to start each day with confidence. How it works How does it work? 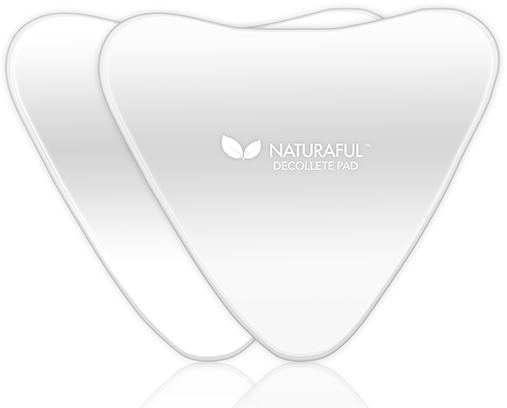 NATURAFUL Decollete Pads are made of 100% Medical Grade Silicone. Electro static energy provided by NATURAFUL Decollete Pads rejuvenates the skin tone and improves the elasticity of the skin. Silicone helps to moisturize the skin by drawing the skin’s moisture to the surface. Hydrated skin is an important factor in healing scars. Continuous use of NATURAFUL Decollete Pads will help skin to regain a smoother chest line, and making it appear supple and youthful. Authentic image. Results may vary. Love these chest pads! I wear them for about 2 hours to get rid of my chest wrinkles from sleeping on my side. The adhesive is really effective. I am 54 years old and a habitual side sleeper. Ive tried many creams and lotions that have done nothing but take my money. With this, I saw results in 3 weeks and it keeps getting better!! My skin feels very moist afterward as well. This is a great product! I'm a side sleeper and stomach sleeper and large breasted so I suffer from deep wrinkles on my chest. After a few times wearing it my wrinkles were almost gone! You have to keep using it though or the wrinkles might come back. "Skin is softer and seeing reduction in fine lines"
When Naturaful Pad is placed on the skin, a micro-climate is created between the skin and the silicone that helps with blood circulation. Moisture is pulled to the upper skin layer and hydration is replenished, helping the skin to plump and smooth itself for a more radiant and youthful appearance. 1 Clean and dry the chest area. Ensure free of moisturizers, sunscreens, lotions or serums. 2 Remove silicone pad from plastic sheet. 3 Place silicone pad on the chest area for at least one hour daily but preferably overnight. & save over 70% off retail! Copyright © Naturaful 2017. All Rights Reserved. Representations regarding the efficacy and safety of Naturaful have not been evaluated by the Food and Drug Administration. The FDA only evaluates foods and drugs, not supplements like these products. These products are not intended to diagnose, prevent, treat, or cure any disease.